Alice Christie’s Port Eliot Festival Post. I looking for some pictures of the flower beds I made for the Port Eliot Festival last year…mine came out a bit blurry…possibly gin on the lens. I remembered Alice‘s post and went to revisit it….I have tried contacting her to ask if I can use them but she seems hard to get hold of….so I’m lifting them anyway and will of course link back to her lovely blog post. Alice’s camera clearly didn’t have any gin on the lens…here are her pics and I will add a little info about the flowers. 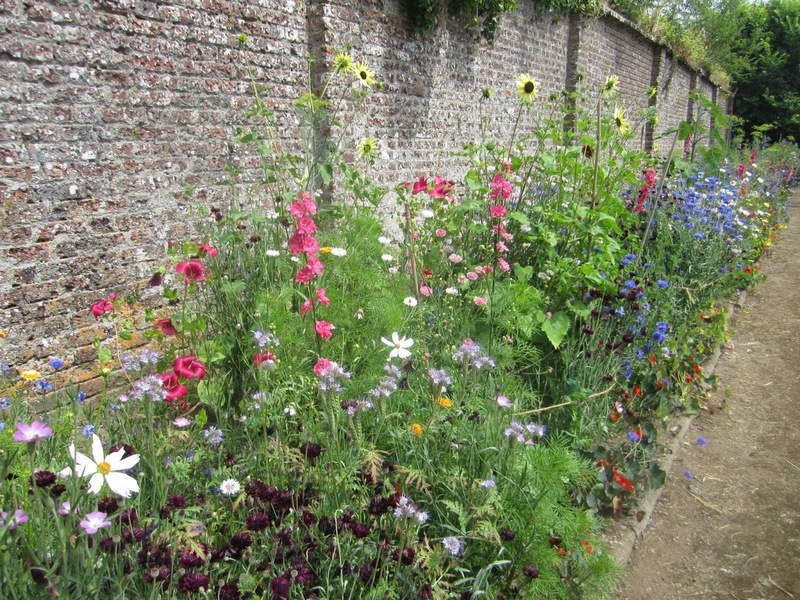 The flower garden at the Port Eliot estate is about 2 metres wide and 40 long…yes…it’s a good sized cut flower patch. Lady St Germans and myself decided that we wanted the patch to have a relaxed vibe and not be a regimented bed…so we opted for a mixed planting. Seeds were sown in the first week of April….earlier than I would normally recommend but we are in the South West, this is a very sheltered walled garden AND we were under pressure to have the garden firing off all cylinders by the end of July….which it was. In the above photo you can see some tall Sunflower ‘Vanilla Ice’…the magenta flowers are Malope ‘Vulcan‘…lots of cornflowers and some Cosmos ‘Purity’…all of these plants were thinned out to about a foot apart. 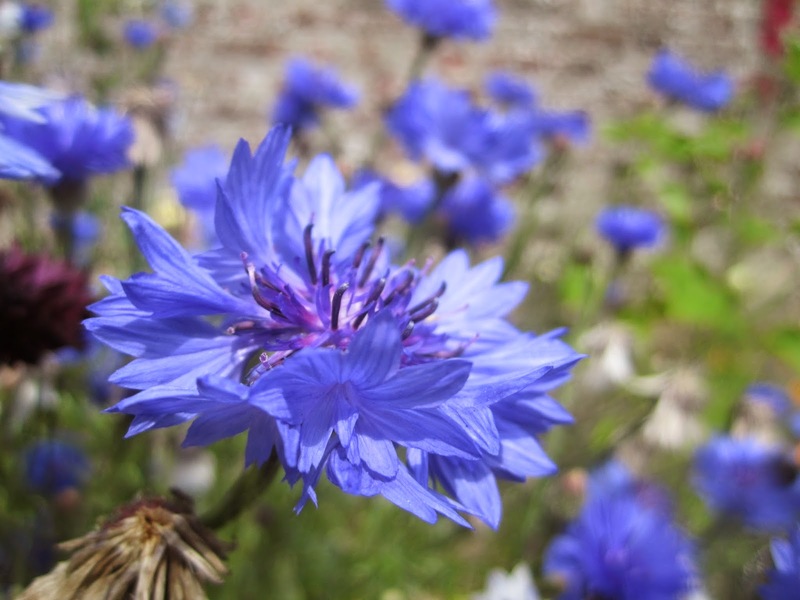 Cornflower ‘Blue Boy’…beautiful…classic and super easy to grow. Seedlings are happy to be transplanted as long as they are no bigger than your thumb….it’s a rule of thumb…a good one. 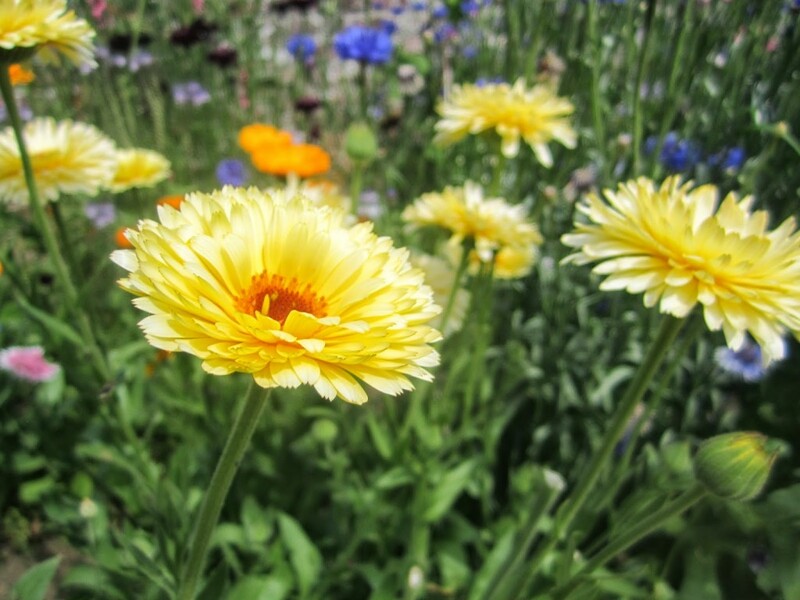 These are the oft underrated Calendula ‘Art Shades’…these plants are flower making monsters….the more you pick the more flowers keep coming….they look stunning in the vase with our friend Cornflower ‘Blue Ball’. Calendula will also reseed year in year out. 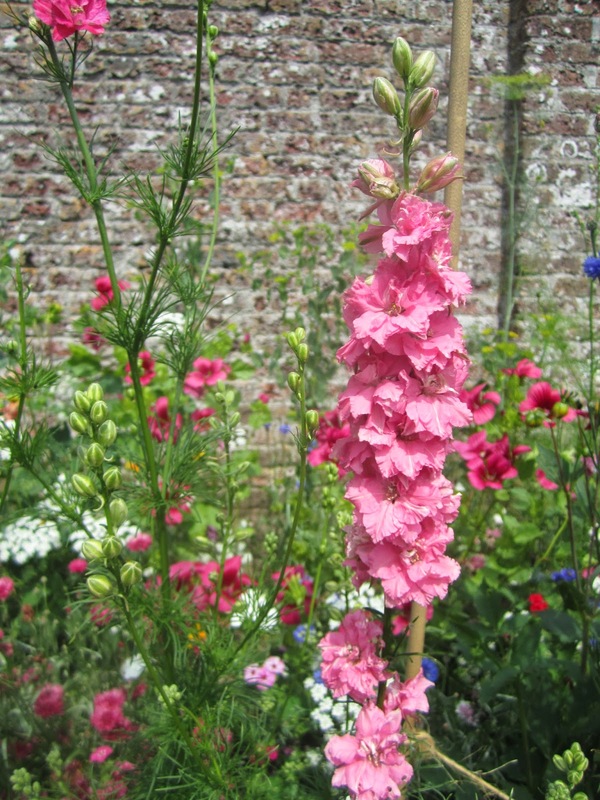 Here we have a Larkspur ‘Giant Imperial’…the ones I stock in the Higgledy Garden Seed Shop are in a mixed colour….this one is pink….but you probably knew that…I’m a fan of the whites and the pale blues myself. Larks always add height interest to both the flower patch and to the vase. Cornflower ‘Classic Romantic’…(lovely pic Alice)…this pale and pink Cornflower is not as widely grown as it should be….it’s a charming little number…gently understated…tres chic and edible to boot. 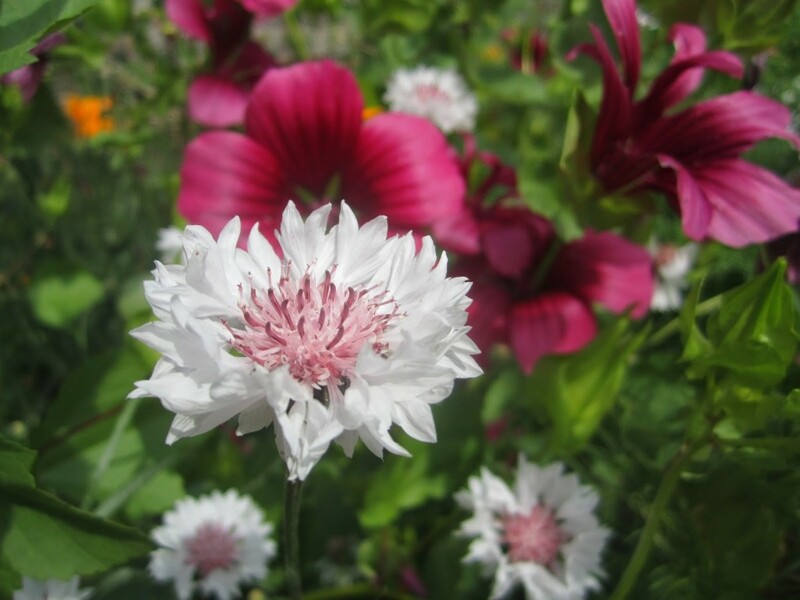 Right behind the bloom we can see the wonderful Malope trifida ‘Vulcan’….this flower is one of those flowers that if you grow it in your flower garden just once, you will never wish to be without it. If you are looking to sow up a patch this April, you could do worse than have a peek at the recent post ‘Seeds To Sow In Early Spring‘…I have a little deal on them this weekend as it goes…you lucky lucky people. Hope all is going well and that the sun is shining upon you. Thanks again to Alice and her blog! The border looks great what support if any did you give the plants? They had a few bits of string on sticks! I usually don’t give my plants support and they are fine….